With NASA’s New Horizons probe zeroing in on Pluto, due to pass it on July 14, attention of astronomers all over the world is focusing in on Pluto. Let’s leave aside the question of whether Pluto is the smallest planet of the Sun or the largest of the Kuiper Belt Objects, and agree that it is an interesting and mysterious member of the solar family. Many amateur astronomers are interested in seeing Pluto with their own telescopes, and this is what we will discuss here. Pluto is at present around 14th magnitude, requiring a telescope with at least 8 inches (200mm) aperture to be seen. The good news is that it is traveling in front of a rich part of the Milky Way, so there will be plenty of guide-posts among the stars to help you find it. The bad news is that it is easily lost amongst those stars, because it will look no different from a 14th magnitude star. With Starry Night, I have plotted a series of charts zooming in on this tiny target. 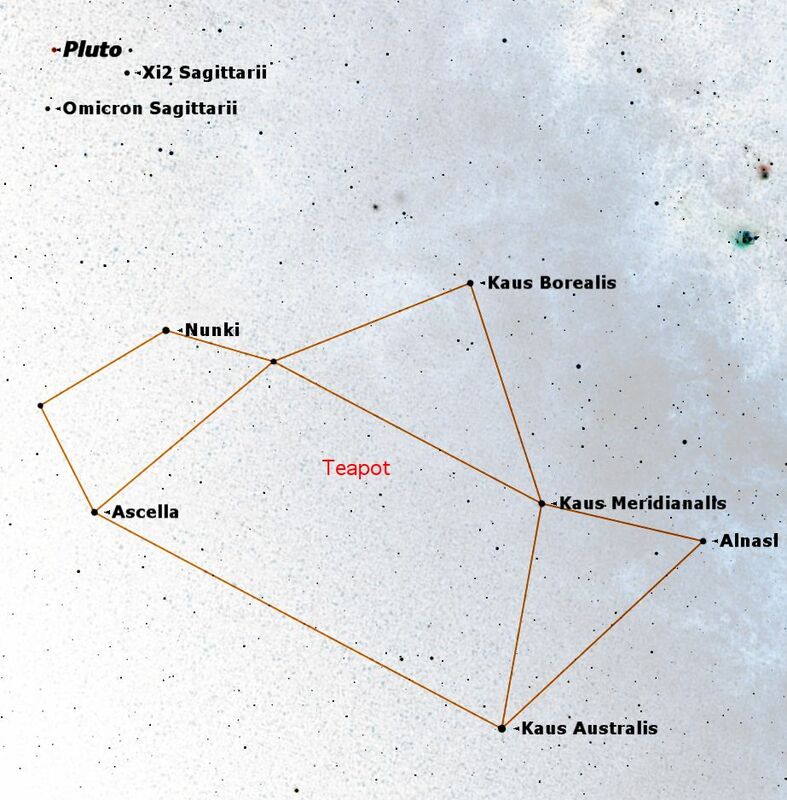 The first chart is what you will see with naked eye and binoculars at 3 a.m. this week: the familiar “teapot” of Sagittarius. Use Ascella and Nunki in the “handle” of the teapot to locate the two 4th magnitude stars Omicron and Xi2 in your telescope. With naked eye and binoculars, locate Pluto in relation to the well-known “teapot” asterism of Sagittarius. It is close to the stars Chi2 and Omicron Sagittarii, just north of the “handle” of the teapot. Credit: Starry Night software. Switch to a low power eyepiece to see the view in the second chart. 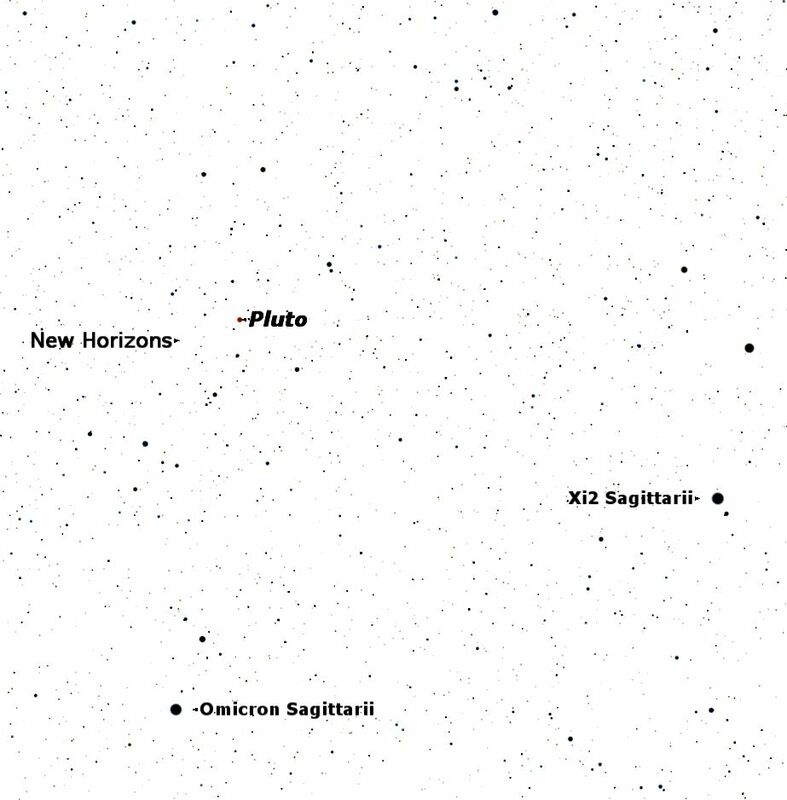 To give you some idea of scale, this chart shows the position of the New Horizons probe, although it is too faint to be visible in even the most powerful telescopes on Earth. With a low power eyepiece in your telescope, zero in on Xi2 and Omicron Sagittarii. Credit: Starry Night software. Notice the wide triangle of 9th magnitude stars just below Pluto’s location which points to it. The left two stars of the triangle point to a wide pair of stars at about 10th magnitude, and these will serve as a reference to locate Pluto’s position in the third chart. This chart shows the position of Pluto for the next eight nights, as seen in a high-power eyepiece. 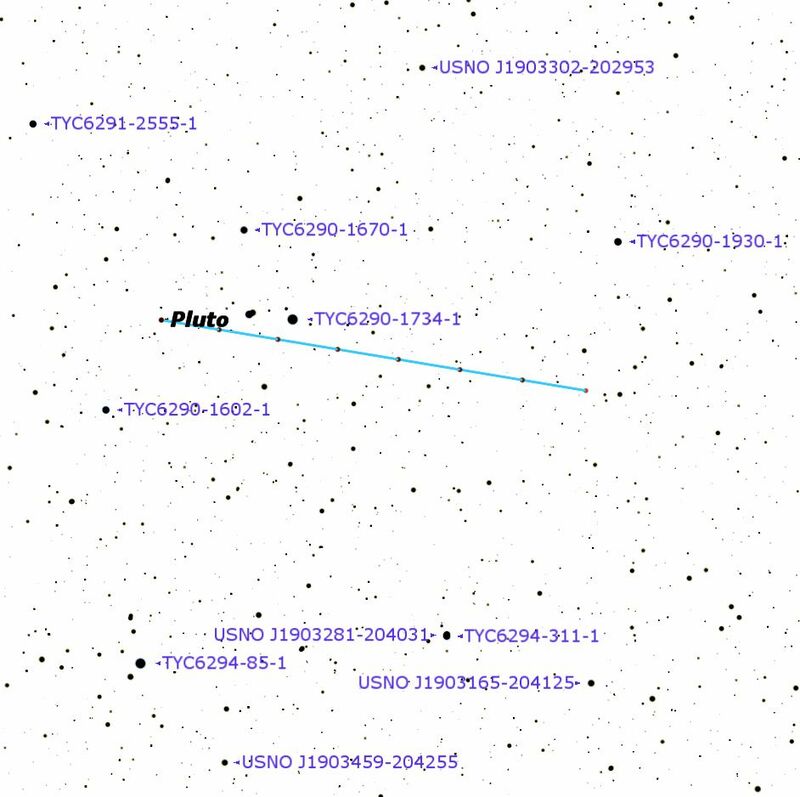 The left-most dot, labeled “Pluto,” is its position tonight at 3 a.m., the rightmost dot, its position on June 4. Remember that the date changes at midnight. Credit: Starry Night software. The brown dots in this chart show Pluto’s position at 3 a.m. EDT on the nights of (from left to right) May 28 through June 4. These dates are for the second half of the night (after midnight), when the date has changed to the next day’s date. Pluto will resemble a tiny star, and the only way to make sure you are looking at the right star is to make a careful plot of the stars in the field. Comparing positions the next night will tell you for sure which “star” is Pluto: It’s the one that has moved. So, to positively identify Pluto, is essential to observe it on at least two successive nights. Because of the great interest in Pluto with the impending fly-by of New Horizons, Simulation Curriculum has released a free app for iOS and Android called Pluto Safari. This will be updated with new information as the fly-by approaches. If you'd like to follow along with NASA's New Horizons Mission to Pluto and the Kuiper Belt, please download our FREE Pluto Safari app. It is available for mobile devices. Simulate the July 14, 2015 flyby of Pluto, get regular mission news updates, and learn the history of Pluto.